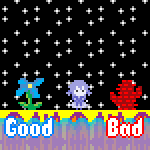 If Toby Fox can make an epic bad ending, so can I. Hmm, I'm sensing a pattern here. SHIP, AND THE TWO CHIEF MATES ON THE OTHER." I did not know that. And there is an entire chapter on the crotch, which is two feet long!